If your house is as crazy over Hamilton as what mine is, I have a great deal for you. The Broadway Musical “Hamilton” was recently nominated for a record number of Tony Awards and is the hottest thing to hit the stage in a long time. People of all ages are loving not only the music but the story behind it. My kids are obsessed with anything related to Hamilton, even shows on the History Channel, and want to know everything they possibly can about the show, its subject, and its creator. “Hamilton: The Revolution” is a 6 hour long audiobook that tells the story of how the musical came to fruition. In addition, it includes as a pdf the full libretto of the musical with 200 footnotes by Lin-Manuel Miranda. The footnotes help explain many of the references in the musical both to history as well as other music. The story is narrated by Mariska Hargitay and includes Miranda as well as Jeremy McCarter, a cultural critic and theater artist who was involved in the project from its earliest stages. 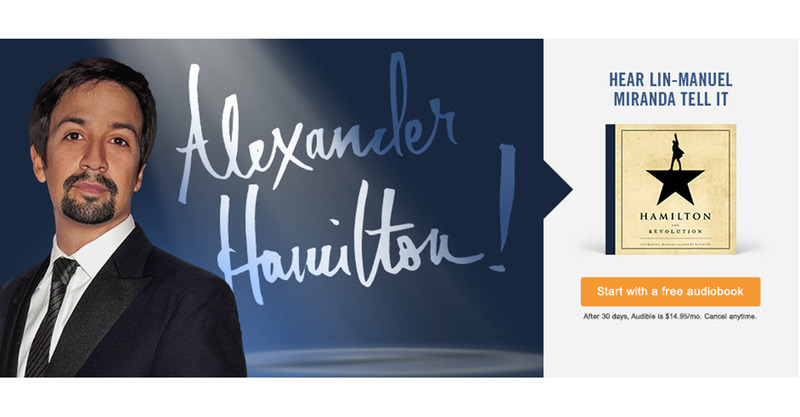 Right now you can get the audiobook free from Audible with a trial membership that can be cancelled at any time. If you are not sure if audiobooks are your thing, this is the perfect way to try them out. And now if you just want to sit back and watch a little Hamilton because it’s on your mind….